I took my bike into the shop last Friday so it could have a tuneup while I was gone for the weekend. I was told the bike would be ready today. I was a little disappointed because I knew I wouldn't get to ride because I had an event to attend this evening. Now, I don't mind at all! The event was a really cool program at the BMW Performance Center. It was a CEO networking event. I arrived around 5:30 with my partner Dan. We took some hot laps around the peformance track in some hardtop Z4s. Wow! That was AWESOME! We then listened to a panel of CEOs from our area. That was educational. Following that we heard the keynote speaker - Kyle Petty! Kyle was very disarming and real. He also gave a very good speech. Nothing against Kyle, but it was better than I anticipated. It was very emotional as you could really sense his passion when he talked about the Victory Junction Gang Camp. Following the speech, I was able to get an autograph from Kyle for a friend of mine during the reception time. We also had a raffle and low and behold I won a Z4 convertible... okay, it was a little pedal car. You can see it above, but the neatest thing of all was that Kyle autographed it for me. I'll let my little boy ride the car, but it won't be left out in the yard! It will be put up after he takes a little spin. I've always had a soft spot for Kyle Petty because of the charity work he does. This is something I want to hang onto. I didn't get to see the Martinsville race yesterday. As Jimmie Johnson was rolling across the finish line, I was in Highlands, North Carolina looking for some mountain folk music. Amazingly, we didn't find any, but we had a good time. Thankfully, I was up against GetAFreeRide this weekend. I say that because my wife and I joined my partner Dan and his wife for a retreat away at a chalet in the north Georgia mountains. No Internet access there... and I had forgotten to bench Kyle Busch and put Gordon back in the lineup! Turns out that I got enough points to have beat anyone except BBuck. Better yet, I was up against GetAFreeRide, so I really didn't have that much to worry about. 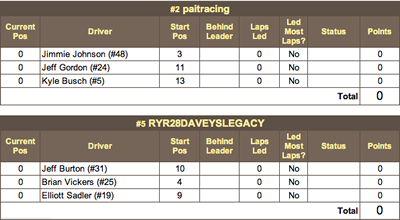 Though, take a look at the finishes for Kyle Petty (10th) and Tony Raines (14th). That ain't too shabby. Had Todd Bodine has another ride like he did last weekend, GetAFreeRide might not have been so free! Anyway, I'm glad to have the win and glad to see the points tighten up a little more. Not much to report on now days. Between the weather and sick children, I haven't been able to do much riding. Monday night I went out and only managed one lap before rain started coming down and on top of that, I just didn't seem to have it in my legs. The weather also kept me off the bike until last night. I went out to Cleveland Park and was supposed to meet a friend for a ride. I think our wires got crossed because he wasn't there - at least I didn't see him there. I went ahead and started lapping the route. I actually felt pretty good. I was averaging 19.7 mph after riding for nearly 40 minutes. About that time, it started to rain pretty well. It was just cool enough for me to decide not to end up getting soaked. So, I started to pull into the parking lot. I signaled to the car coming out the lot that I would going to turn left. However, the guy decides to just go ahead and start pulling out - as though he was trying to time my passing him as I went straight. I had to put on the brakes and because of the water, my rear tire fishtailed. Thankfully, he stopped and I was able to get around him. This is the second time in three rides where people driving cars have ignored my hand signals. I make sure I use the signals that you learn in drivers ed and you have to know in order to pass your driver's test, but man, you start to wonder how many people actually remember them! Thankfully, I have learned to be alert and defensive. I simply ride as though they don't see me and anticipate those kind of bone-head moves that I saw last night. It was a weird night at Lowes Motor Speedway. I came into the night expecting to get plastered by Super_D. It was a foregone conclusion that BBuck would win his matchup. The expectation was that I would come out of the evening behind BBuck. Well, that isn't what happened. Jimmie Johnson led the way for my fantasy team and finished second. Kyle Busch fought his way through the field more than once to place sixth. Yep, Mark Martin got turned into the wall and went to the garage in thirtieth. Because of the top ten finishes of the Hendrick cars it didn't matter. Super_D ran into trouble early on and couldn't recover. Kurt Busch was the first to run into trouble and though he ended the race running, it was in thirty-second place. Matt Kenseth, who had his own multiple issues in the night, had the best place finish with fourteenth. Ryan Newman struggled as well rolling across the line sixty-two laps off the pace in twenty-seventh. However, the strangest thing is that BBuck lost to GetAFreeRide! Tony Raines has a surprisingly good night to finish seventh. Todd Bodine, who you don't even expect to be in the show, showed up and took home nineteenth. Kyle Petty did his normal ride and finished in twenty-second place. All the while, BBuck's best finisher was Tony Stewart, who was one lap down. Denny Hamlin wrecked very early on and came back on the track to salvage some points and Kevin Harvick limped home with fourth gear only. All in all, it was enough to give GetAFreeRide "his" first win of the year. Jeff Gordon was proving me a liar until a few laps to go when his engine blew. The funny thing was my heart skipped a beat because I figured that would give Super_D a chance to beat me. Then I remembered that I had benched Gordon. Whew! Well, he can hang up the championship for sure now. Thankfully, I'm still in the hunt. Sorry that I haven't posted in a couple of days. It isn't that I haven't been doing anything. It is just that I have been pretty busy and when evening rolls around, I think to myself, "I just don't feel like I can think of anything." In the mornings, I've been hitting the ground running and just have not had time. Now that is out of the way, I'll catch up a little bit. What's this about being a swan? Let me explain. When I first started riding a bike on a regular basis - what about 12 years ago? - I only road my mountain bike. I can remember riding through Cleveland Park along the small trail that runs above the main park area. I would look up as I strained with my big knobby tires among the roots and dirt and see the roadies as they gracefully flowed along Woodland Way. I looked back down at the dirt as they swooped on by and thought to myself, "They're the swans and I'm the ugly duckling." Well, Thursday evening I headed out to do my ride in Cleveland Park. Once there I started doing some laps. I was trying to see what I could get done in an hour. On my third lap I began to climb Woodland Way. To my knowledge, I was all alone. However, I looked back as I neared the crest of the hill and there was a group of about eight riders coming behind me. Would I be a swan or an ugly duckling in spandex? The group went around me and I jumped on the back of it. Off we went. It was fun. I mean these guys were moving - they were sustaining speeds over 23 mph. I was right there with them for a lap. I think it kind of surprised them. It was as though they were trying to drop me and when I didn't drop, they decided to let me hook on for the rest of the ride. As we were going into our second lap and started to climb Woodland Way again, the cadence started to drop. I actually felt more comfortable pulling around some of the other guys and by the top of the climb, I was third in line. About that time, I heard, "Hey, Jonathan!" It was Carlos - one of the guys I was waiting for to show up to ride with me. So, I backed off and joined him. I watched the group leave. For a moment I was a swan. As it was, the group broke up before long. Carlos and I rode for a short distance together and then I opened things up again. I managed to finish the hour's ride with an average speed of 19.6. That beat my best time by .2 mph. I can tell it is going to take a lot to reach my goal of 20 mph. However, I think it can be done. Hey, but what about the big race tonight? Well, I have decided to bench Jeff Gordon. He just has not had what it takes in Charlotte this year. Jimmie, Mark, and Kyle all qualified better than he did. I believe he will put the nail in the coffin of his championship hopes this evening. As for me, things are precarious. I go up against Super_D tonight while BBuck gets a give me. That means, BBuck is sure to get a win tonight and I will have a struggle. My drivers roll off 7, 10, and 18. Super_D's guys start in the 11, 15, and 42 positions. Of course, Kurt Busch, who is the driver in 42nd place, is there because of a rules infraction after qualifying 3rd. That isn't a lot of comfort for me. We'll see. Lowes at night is always fun. Back in mid to late 1990s, I helped to design the initial Web site for Sunshine Cycle Shop. At that time, I started a little section on the site called TrailMix. It was to be a place where I posted articles about riding mountain bikes as well as reviewing the various places to ride around the area. TrailMix is now long gone. However, something reminded me of the articles I had written and I began to wonder if they still existed. It took a while to find them, but I finally came across them buried in a directory online. I've decided to bring them out and publish them here so that I will have a record of them. A lot of water has gone under the bridge since those days! Hope you enjoy them, but I realize that I'm not the greatest writer in the world and the purpose for having them here is more for my memory. Let me introduce myself. We will stay with the pertinent information--the bike I ride. I remember when I first got interested in mountain bikes. Burned out on organized sports, mountain bikes seemed to offer a chance to get out in nature alone and keep in shape. So, I made my way down to the greatest place to buy a bike. Toys R Us. My first bike was a Huffy. Ah, what a beaut! At 99 bucks, it was a steal! Thirty-six pounds of raw power. With a purple marble paint job, water bottle holder, 12 gears--I was ready to thrash some single track! It wasn't long before my euphoria gave way to reality. My first indication that it wasn't going to be a lasting relationship was when I took it to Sunshine to have the wheels trued (I hadn't learned to bunny hop and kept crashing into curbs with the rear wheel). It seems that the steel Huffy rims aren't very flexible. The guys at Sunshine did their best and didn't even laugh at me (at least not to my face). They got me back on the trails in no time. I did my best to avoid the curbs. On the trails, however, I was getting more daring with each outing. It was this daring that killed the Huffy. In a seeming uneventful ride through a downtown park, my friends and I came upon a little down hill single track that ended in an asphalt road. As I began my descent, I noticed my brake lever was askew due to a brush I had had moments earlier with a small tree. Attempting to fix the problem as I started down the hill was not wise. For just a moment my eyes left the trail--and my bike followed. My Huffy struck a rock and tacoed the front wheel. The rear wheel rim picked up a huge dent. Amazingly, I made it down to the road in the saddle. It wasn't until I reached the curb (I still couldn't bunny hop) that I came off the bike. For just a moment I thought I would make it, but the impact of the curb wrenched the handles from my hands and I did a superman into the asphalt. The guys I was riding with said that it was beautiful! I didn't even think about me. I was worried about my bike. I assume the tears were due to the burning sensation on my hands, arms, and knees. Okay, there was some moisture in my eyes because of the passing of the Huffy. The wheels were beyond repair, the handle bar was bent, and the frame was cracked. I knew I was going to have to say goodbye. It is not good to become depressed about such things. I wasn't going to let this get me down. So, as I nursed my wounds on the way home, I was already planning my next bike purchase. Hmmmmm, I wonder if a Murray would be better? Do you have a story about your first bike? If so, pass it along and I'll be glad to publish it here as well. The next story is titled, "The Tank." I'm starting to see a pattern here. My team gets off to a great start and then turns upside down in the closing laps. I went from having all my drivers running in the top five to having them spread out all over the track. The race between first and second in the fantasy league has tightened. I maintain the lead at 20-8-1 and BBuck picked up on me at 20-9-0. Super_D remained steady at 19-10-0. So, what do I think about the Vickers/Johnson fiasco? I'm not a Vickers fan - or a Johnson fan for that matter. The way I see it is that Johnson and Vickers went low in order to go around Earnhardt. Junior moved slightly to block which altered the line for Johnson. Vickers didn't anticipate the movement and the run he had on Johnson. He slightly touched the 48 and the rest is history. Did he intentionally wreck them? No way. Was he trying to win the race as opposed to helping Johnson win? You bet. Talladega is always a shootout with bullets flying everywhere. You never know who will escape the "big one" or who will be leading with 5 laps to go just to get dropped out of the draft and end up 20th. Going into this mayhem, I face off with BBuck - my closest competitor in the fantasy league. After losing three in a row, Tru-Jr-Fan should get a win today going up against the give me team. Super_D and RYR28DAVEYSLEGACY have the longest winning streaks of the moment - the former with three wins and the later with two. They face off with Super_D hoping to cut into BBuck's hold on second place. Should I beat BBuck and Super_D win, there would be a tie for second place and I would stretch my lead back to two races. So, what do I think will happen? Ha! I have no idea. At least my drivers for the race - Gordon, Johnson, and Shrub - all got good starting spots. They roll off third, fourth, and sixth. If they can hook up and draft, stay out front, and avoid the big one then I stand a chance. We'll have to see when the bullets start flying! This morning I got up in order to make it to the meeting place where Dave, Chris, and I planned to load up our bikes on Chris' car and drive up to Tigerville so we could do the Bakery Ride. I got there just in time and discovered we had an additional rider coming along. John was going to join us. Unfortunately, we didn't have room to add John's bike to the car so he had to drive up separately. Man, what I wonderful ride! It was in the fifties when we finally made to the edge of North Greenville University. We parked there and unloaded our bikes. Pretty soon we were on our way. I was glad that I had on long tights and shoe covers. I also was wearing a long sleeve undershirt beneath my jersey. Unfortunately, I had on my fingerless riding gloves. Before long, my fingers were pretty cold. Still, the ride was so much fun, I didn't really even notice it after a bit. We averaged about 13.5 mph on our way up to the Wild Flour Bakery in Saluda, NC. We stopped once along the way to see the sun come up above a valley. You could see small mountains all around. It was a great moment. At the bakery, I got a muffin, a cup of coffee, and a Yoohoo. There were all kinds of good looking stuff, but I don't think my stomach could have handled it! I was surprised that I was able to eat what I did. I must be getting used to eating on a exercise stressed stomach. As we were leaving, I noticed there was a bike shop next to the bakery. I went in and got me some long fingered gloves. As we headed back down, I was very glad I had done so! Going back down we rarely dipped below 20 mph. Most of the time we were around 25 mph with a maximum speed for my of just over 40 mph. We had sustained runs where we exceeded 27 mph. We had the train chuggin' and we were moving out. In the end, we road for nearly 36 miles and averaged 16.6 mph. The whole ride only took us about 2 hours of ride time. It really was a blast and I'm ready to do it again. Oh! Where were you when you passed 1000 miles on your first road bike? Me? I was riding back from the Wild Flour Bakery with good friends. I can't believe I have managed that many miles since the first of August. I have been swamped the last couple of days. Things have been busy all around and the last couple of evenings I have been working on the plumbing in one of my bathrooms. I have determined that I will never work on plumbing again. I will hire someone to come in and do the job. It will be worth it! Chris and John road Tuesday night. I joined them for several laps of Cleveland Park. Chris and I pushed for an average speed over an hour. We started off kind of slow. Both of us were pretty tired. After several laps we were finding our legs and picked it up. We were on our way to climbing to a 19.2 mph average and then we ended up getting behind a truck that was rolling at a pace between 10 and 15 mph. I watched our average drop on my computer as we had to slow to follow the guy. Once we got around them, we pushed hard and finished with a 19.1 mph average. We hope to ride again tonight. We're preparing for the "Bakery Ride" on Saturday morning. I have never rode the route, so I am kind of interested to see how much of a work out it is. It appears to be a favorite ride for a lot of people around here. I'm going to try to learn more about it before we head out. Last time I made it over the mountain in 23.30 minutes. Tonight, I made it in 23.19. I made it back over the first time in 24.89 for a total of 11.56 miles. This time I made it back over in 26.10 for a total of 12.09 miles. I'm not exactly sure where that extra mile came from. Several other things were the same as well. My average heart rate for both rides was 168. My average speed was 14.3 on the first ride and 14.7 tonight. My max speed then? 45.2 mph - Tonight? 45.1 mph. The work load back in September was 991 and the load tonight was 932. That night, my heart rate peaked at 185 bpm. Tonight, I just barely touched 183. One thing is for certain, it sure gets darker earlier! I was heading back to my car and it was kind of scary as I headed down the mountain. I have lights on both the back and front of my bike, but I had this nightmare that some kid was going to playing rally car around those curves and run me over. I'm not sure I'm going to ride that route after 7 p.m. anymore. Well, it happened - just not the way I thought it would. I got beat yesterday in the NASCAR fantasy league. Not only that, but Gordon took a big hit in the standing. Until about the last 20 laps, I was killing the competition. After that, things just fell apart. First, Gordon had a fuel pump fail which sent him behind the wall with not enough time to get the problem corrected and back out to pick up some laps. He finished 39th and fell to 6th place 120 points back from leader Jeff Burton. Then Johnson had his problems because Kasey Kahne spun out at the entrance of pit road causing Jimmie to have to go back out on the track losing momentum and getting in trouble with speeding. After leading the most laps for the day, he ended up 14th. Oh well, at least I still hold the lead in the fantasy league. Even though BBuck won and gained some ground, I still hold the top spot going to Taladega. Gordon also is running well except for the mechanical issue. Perhaps he can make it a run for the history books and pull off the win. What a turn around for RYR28DAVEYSLEGACY. He started out the season basically as a door mat for the rest of the fantasy league teams. However, he has traded some drivers and some of his drivers have really started to pour things on. As you can see below, his drivers have a better starting average than mine. The problem for him is that they don't always finish that high. Elliot Sadler has really run well of late, but has had trouble closing the deal. Vickers is always somewhat of a question mark. He probably has the ability to win any race he comes into and sometimes looks like he will, but then drops off. I'm hoping that it will be the same way today. However, if those drivers pull it together, I could be handed a loss by the last ranked team in the league. The funny thing is that it really wouldn't be that much of a surprise. Busch or Martin. That was the question. Martin starts off 19th and Busch starts off 13th. Martin is sixth in points and Busch is tenth. I go back and forth. Even though I have Martin benched in the above lineup, I may put him back in and bench Busch before the race starts. That is how up in the air it is. On the championship front... I was a little disappointed that Gordon didn't qualify closer to the front. However, Kansas is a lot like Chicago and he was tearing it up there. Matt Kenseth and Jeff Burton start ahead of him - though only by a couple of spots. If he can finish ahead of them, he should be able to at least maintain his spot towards the top of the standings. The is still a ways to go - today will not the champion make.